Stanford researcher Zhenan Bao has proven out a new way to to make ultra-efficient transistors using ribbons of single-atom-thick graphene. First discovered in 2004, graphene is a single-atom thick carbon material that can conduct electricity much faster than silicon. That property has made it a promising material with which to make microscopic transistors that make up super-efficient processor chips. The problem has been graphene’s lack of a sufficient bandgap — the difference in resistance between a transistor in its “on” and “off” states. This lack of bandgap allows too much current leak to make graphene a practical substitute for silicon. Bao and her team set out to exploit recent theoretical and experimental evidence suggesting that graphene fashioned into ribbons less than 10 nanometers wide will possess sufficient bandgap to be used as transistors. The problem is in fabricating such thin strands of graphene and positioning them precisely enough on a silicon substrate to become the circuitry of a processor chip. Bao decided to use DNA to achieve what has heretofore seemed impossible. Her team began by spin-coating a silicon substrate with a solution containing bundles of double-stranded DNA. By adjusting the solution’s buffer Bao was able to control the thickness and length of the strands, ultimately producing thin DNA bundles up to 20 micrometers long and aligning them on the substrate. The team infused the DNA strands with copper ions, then heated them at very high temperatures together with methane and hydrogen gases. The copper ions served as the catalyst causing the depositing of 10-nanometer-wide ribbons of graphene formed from carbon that had made up the DNA and methane. The ribbons aren’t perfect, Bao notes, as some regions have more than a single layer of carbon atoms and may more strictly be called “graphitic”. Nevertheless the team showed a way to create graphene ribbons thin enough to possess sufficient bandgap, and to deposit them in precise formation onto a substrate — the fundamental requirements needed to produce computer chips. The team’s success “opens up a new path” to a method for manufacturing graphene transistors and circuits on a large scale, said Bao. 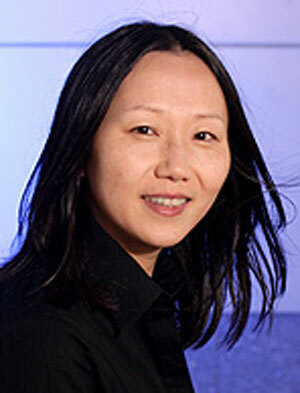 Zhenan Bao is a professor of chemical engineering and material science at Stanford. She received her PhD in chemistry in 1995 from the University of Chicago before joining the Bell Labs materials research department. She joined the Stanford University faculty in 2004. Bao currently has about 285 refereed publications and 65 US patents. Her team’s study on using DNA to form graphene transistors was published in the journal Nature Communications. Stanford University chemical engineering professor Zenan Bao has been recognized as one of the world's most innovative young scientists.